A medical assistant giving sedative to the emotional woman. SIBU: A family was terrified when a pet kitten was eaten alive by the family’s Indonesian maid said to be possessed by an evil spirit. The woman employer found the remains of her pet in the front portion of her house Thursday night. The horrified woman said only the skin of the kitten had remained. “When I queried the maid, she told me she had eaten the kitten,” the employer claimed. “Later, the maid went berserk, compelling us to tie up her limbs. “For safety sake, we left her in our car outside our house compound overnight,” she related. The following morning (yesterday), the family untied the maid after noticing her in normal condition. The employer said she promised the maid she would allow her to return to her mother-land if she so wished. “To meet her demand, I brought her to buy ‘chicken rice’ at Ramin Way at around 10.30am. “After I’d got the food, she refused to get into the car, creating a scene. “She ran amok. She got into the car and threw things out. She also bit an ornamental tree,” the employer said. The police were summoned. Four came, including a policewoman. It took them an hour to get the maid into the police vehicle. Later, according to the police, the maid behaved wildly inside the police vehicle, damaging a mirror. When a policeman tried to handcuff her, he got bitten on the arm. The maid also spat on the policemen. 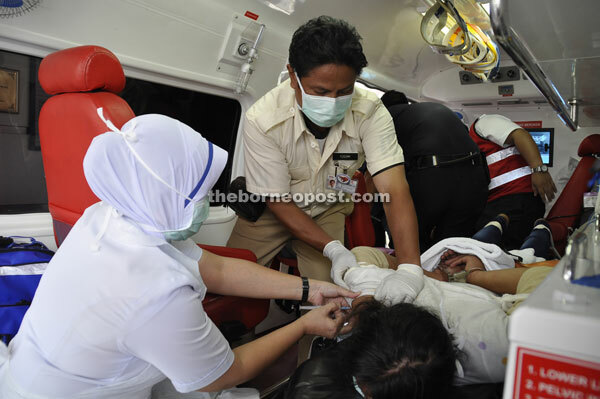 At the police station, it took several policemen and policewomen to get the maid into an ambulance for the Sibu Hospital. They covered her face with newspapers to prevent her from spitting on them. Meanwhile, according to the employer, the maid had been acting strangely since a week ago. “My mother had seen her eat non-halal dumplings. The maid would usually ask permission for food but not since a week ago,” she recalled.